Not much of an update... I've been out of town for the past week, so I haven't gotten much of anything done. 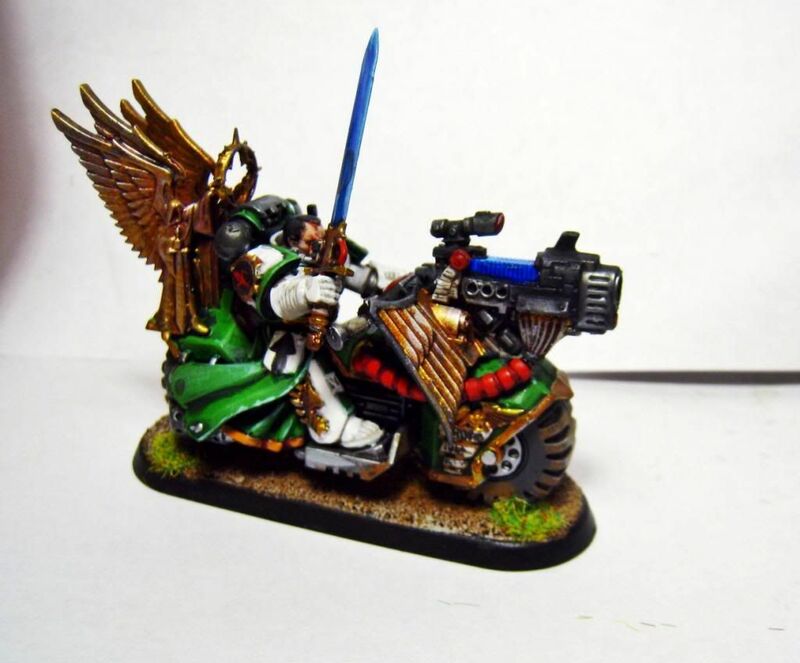 Finished the plasma gunner for the Ravenwing Bike Squadron for the store's copy of Dark Vengeance, though. Them there bikes is real purdy! I don't normally post unpainted miniatures. 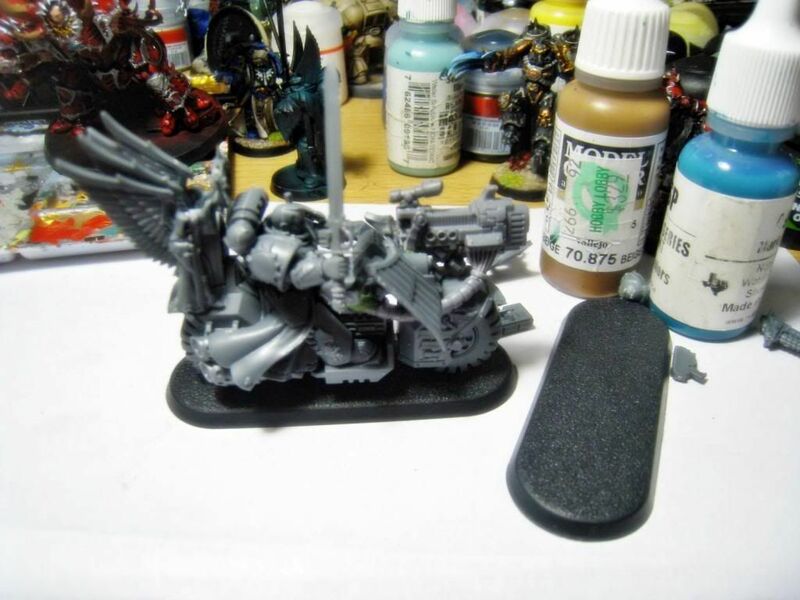 But I'm pretty happy with how this conversion came out. 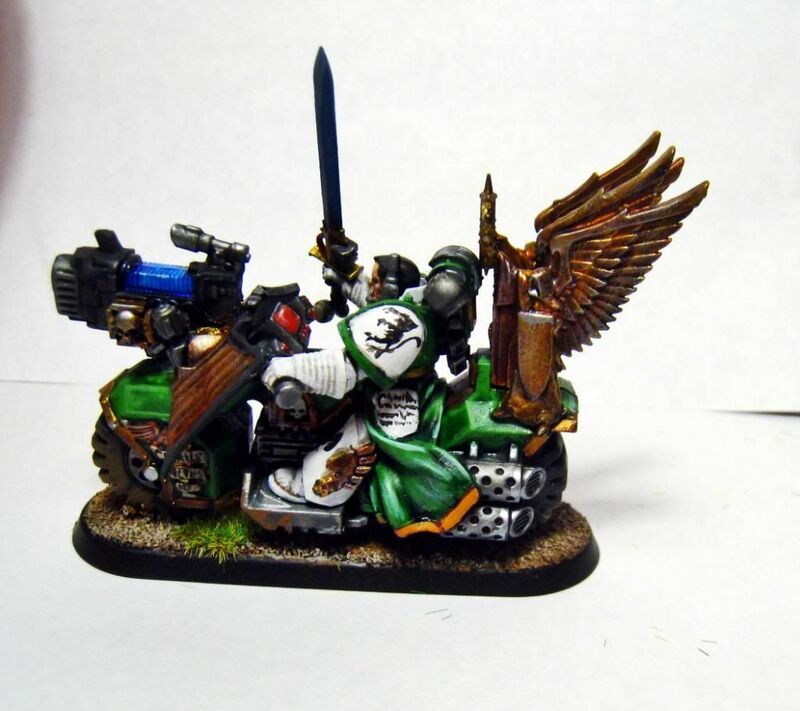 Codex: Dark Angels gave me the kick I needed to actually do something with the 50-some-odd bikers I own, so I picked up a Ravenwing Command Squad and decided to covert a counts-as Sammael, as well as a Chaplain and an extra guy. 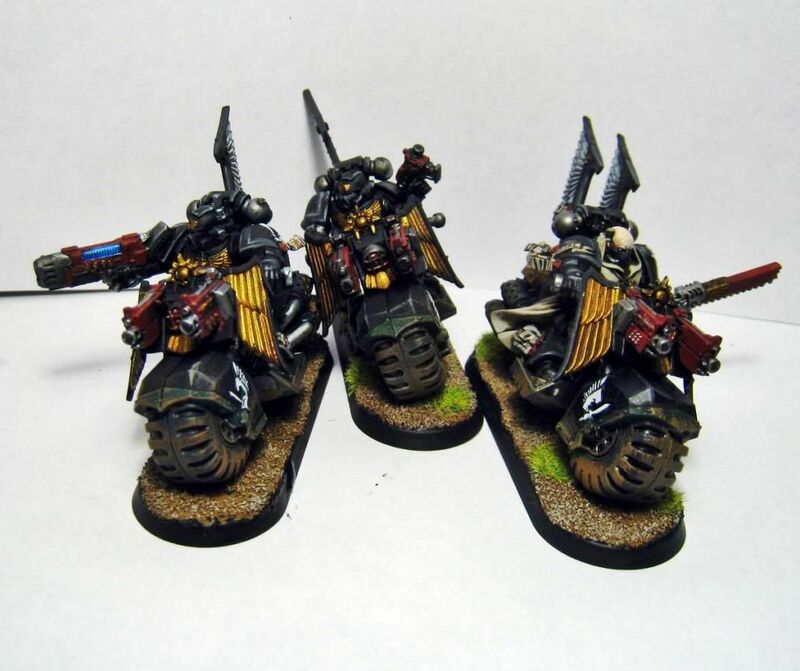 They'll be a strike force drawn from the 6th Tactical Reserve (the Reserve Company from which Codex Chapters draw their bike squads and land speeder crews to attach to a Battle Company) for my Lions Rampant... there should be a link to the Chapter fluff and all that in my signature. 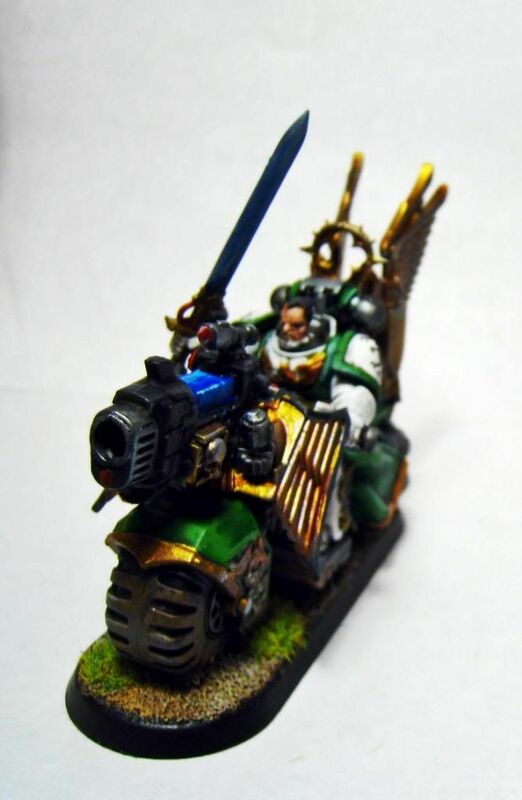 I figure that since Sammael's jetbike is the only surviving example of an Imperial jetbike, the Lions Rampant would not have one-- especially not for the Captain of a Reserve Company. 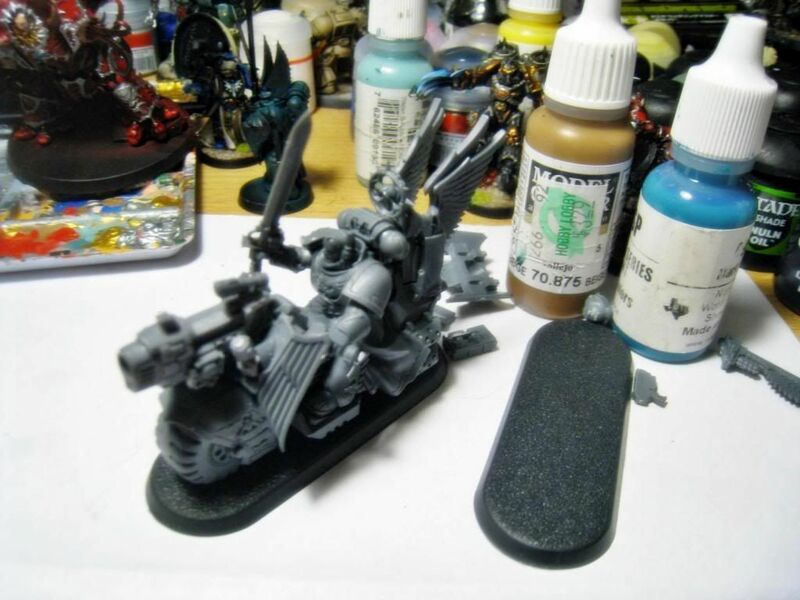 But mounting a plasma cannon to the fairing of a regular bike? Well, that's doable, right? I figure the other benefits of the jetbike can just be chalked up to Captain Tauro (errr..."Sammael") being a skilled rider or something. 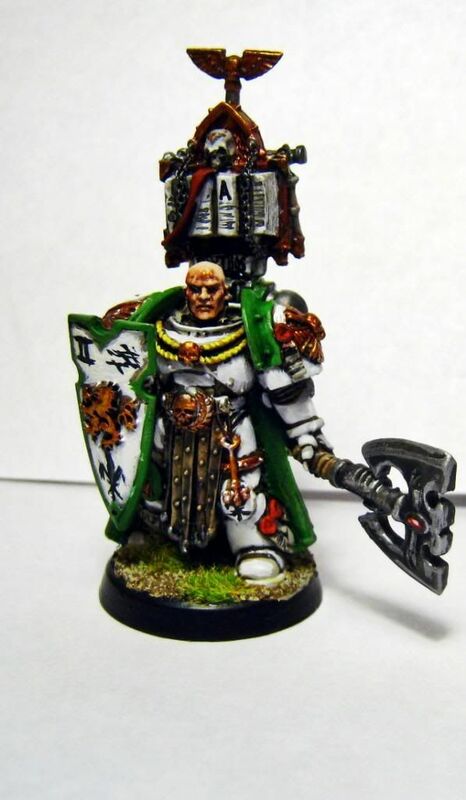 This is basically just the sergeant out of the Ravenwing command squad box, with a Grey Knight sword, and a plasma cannon. I used a bit of green stuff to attach the power cable to the bike's fuel tank... I figure there's probably a fancy fusion battery or something in there that the plasma cannon can be hooked up to. Really not that complicated beyond cutting the fairing and the plasma cannon to fit together. Last edited by The Son of Horus; 01-13-13 at 05:41 AM. 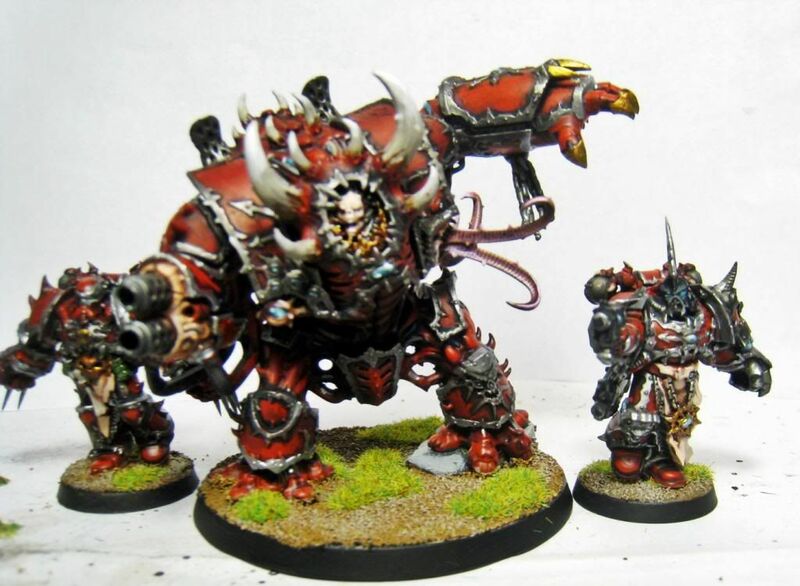 A couple more models done for the store's copy of Dark Vengeance. 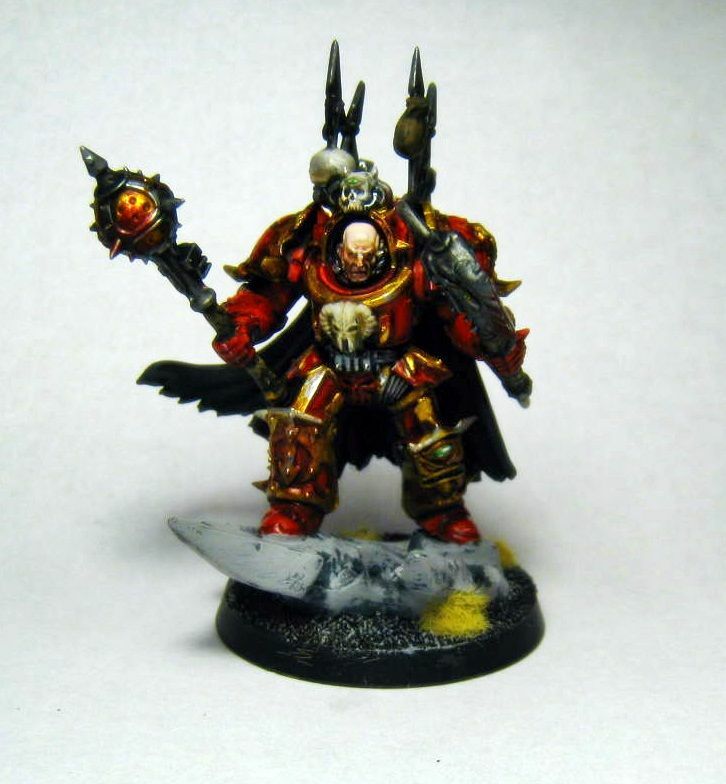 I've always liked the Word Bearers, and the deep red is quick and easy to paint. Looking great, SoH, any chance of a group photo? These are the Captains of the Second and Fourth Company of the Lions Rampant, respectively. I didn't paint these recently, but I never took pictures of them for some reason. 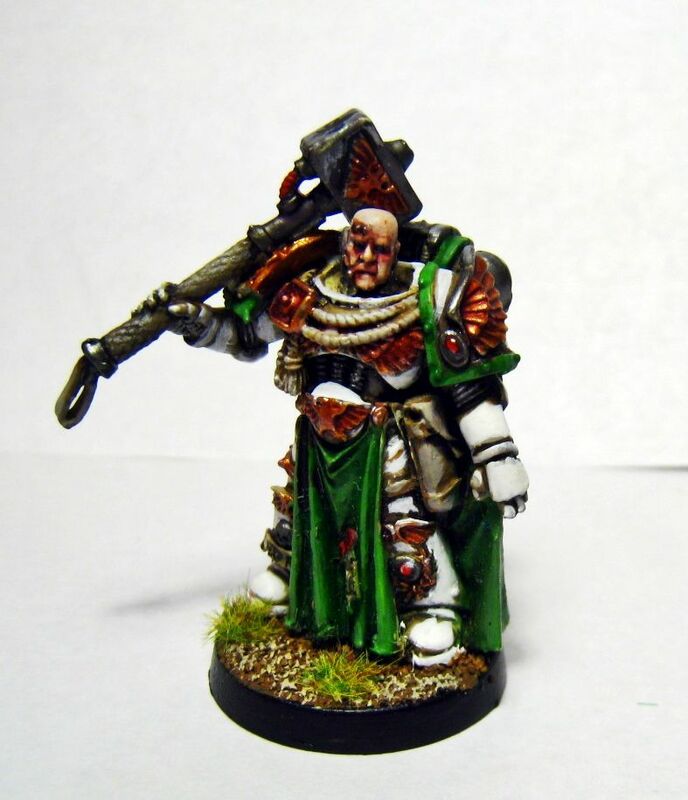 I also (mostly) finished my counts-as Sammael, Captain Tauro of the 6th Tactical Reserve. All that's left is to touch up the freehand iconography, which I'll do when I'm not a little twitchy from caffeine. Finally, this is my current project-- a Lions Rampant Nephilim. 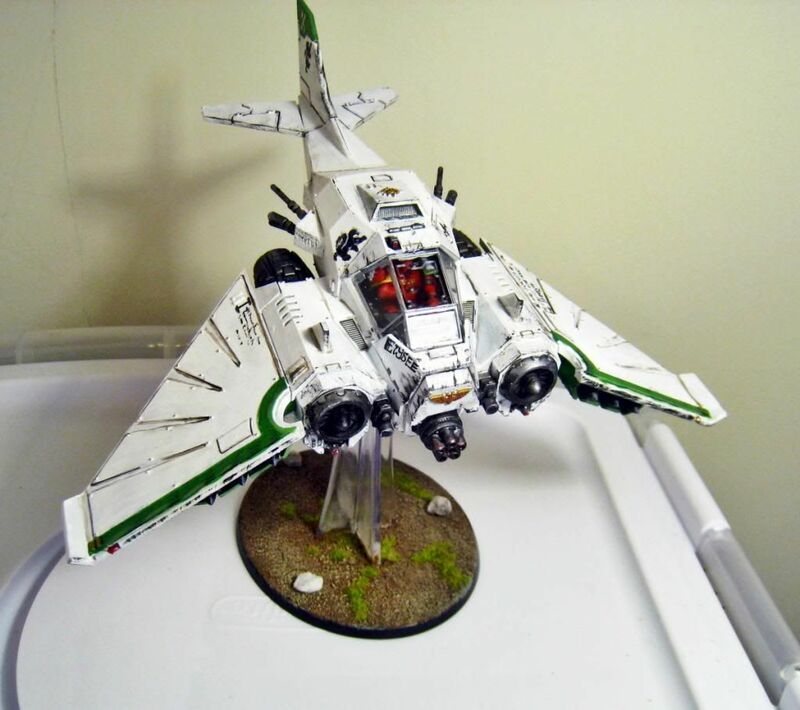 I figure I'll count it as a Stormtalon, as I'm not going to be "that guy" that jumps codecies every time a new one comes out. The new Nephilim/Dark Talon model is so very cool though, and it's much more what I think the Stormtalon should've looked like in the first place. The main weapon fits in snugly without glue, so I can switch between the avenger bolt cannon (which will represent the assault cannon most of the time) and the twin-linked lascannon as needed. I figure I can run it as a Nephilim proper in Apocalypse, after all. 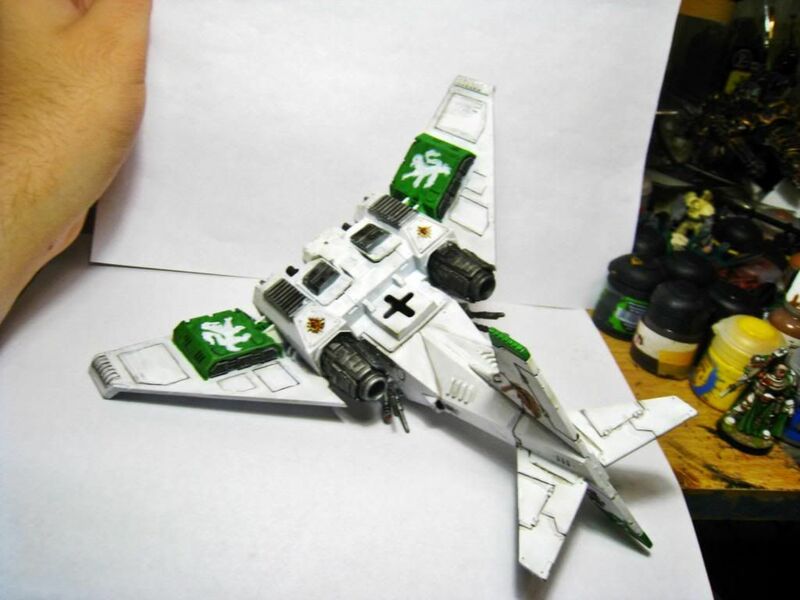 I shaved off the Dark Angels chapter icons on the undersides of the missile pods, but decided to leave the Ravenwing icon on the tail alone-- there are other details I didn't want to screw up on the tail by removing the Ravenwing icon, and when painted differently, the Ravenwing logo can easily look like generic fast attack heraldry, I think. 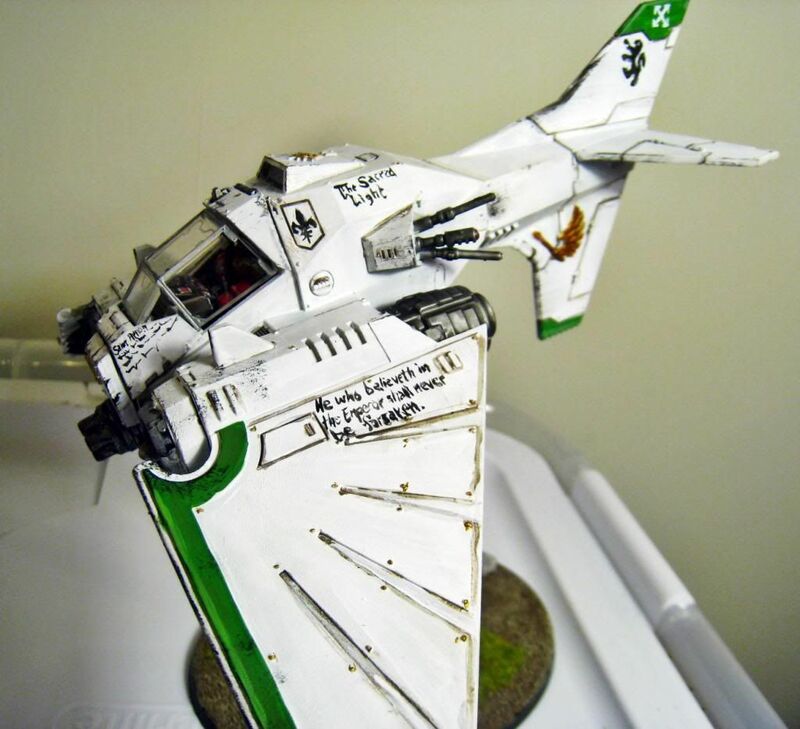 At this point, I need to clean up the freehand iconography and lettering-- I put it on purely to block out where it was going-- and finish the pilot and canopy--both have to be painted separately before being glued in place. Finished up the Nephilim today. I know folks are lukewarm about their in-game effectiveness, but it's just such a cool model. The mega bolter and the twin-linked lascannons are interchangable on the model without needing magnets, which is great. 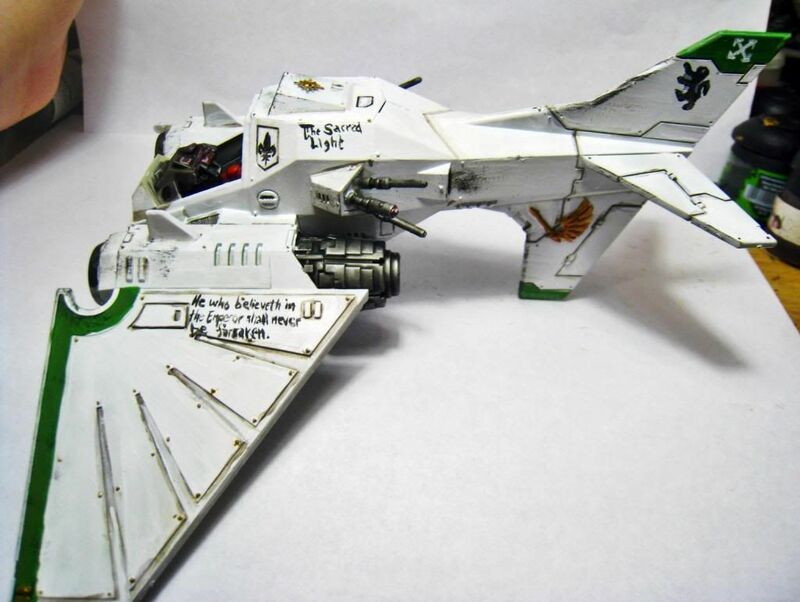 I touched up the freehand markings, and added some more carbon scoring from atmospheric flight-- weathering aircraft is such a different beast than weathering tanks, and it's something I've never really gotten the hang of. I'm surprised how much I actually like the Nephlim in white, to begin with I wasn't sure but I have had a look at yours a couple of times now and it's good. It needs some more work on the high speed aspect of the weathering imo, streaks coming off rivets, more leading edge abrasion trailback damage that sort of thing. It would help with the dynamics of the overall mini by suggesting speed. Loving that fighter in the white plate! I've been fairly busy lately and haven't had much time to sit and paint. I just finished a piece for a local Magic: The Gathering judge, who had asked me to paint a model for him sometime- he's an appreciator of the arts. 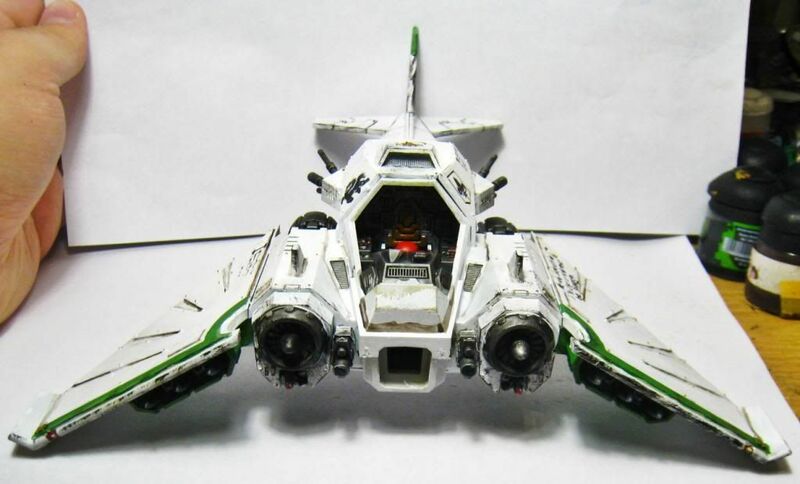 Also, a potential addition to the local 40k community. Either way, I have ended up with an undemanding local commission client with disposable income, so... it's all good, right? 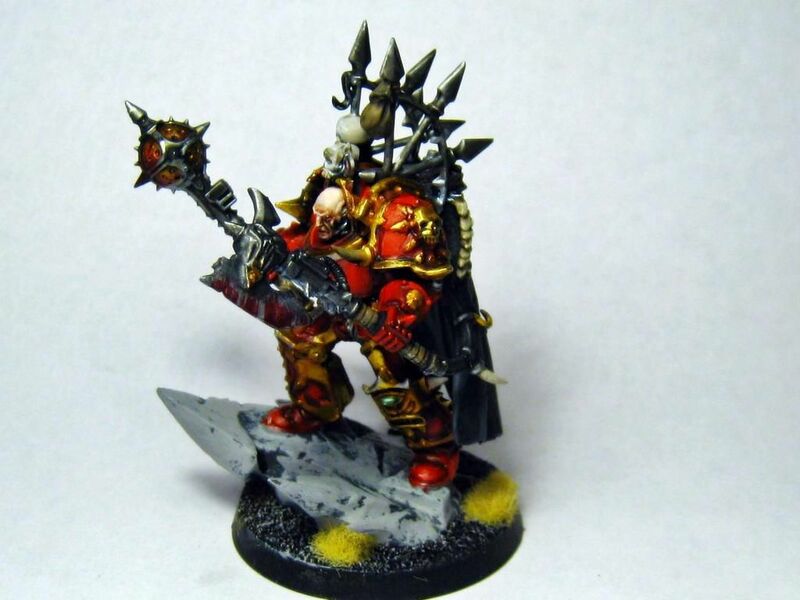 I had free reign to do what I wanted with the Chaos Terminator Lord he picked out. The only stipulation was that the model should not have a gun, so it could potentially be used in fantasy roleplaying as an anti-paladin or the like. 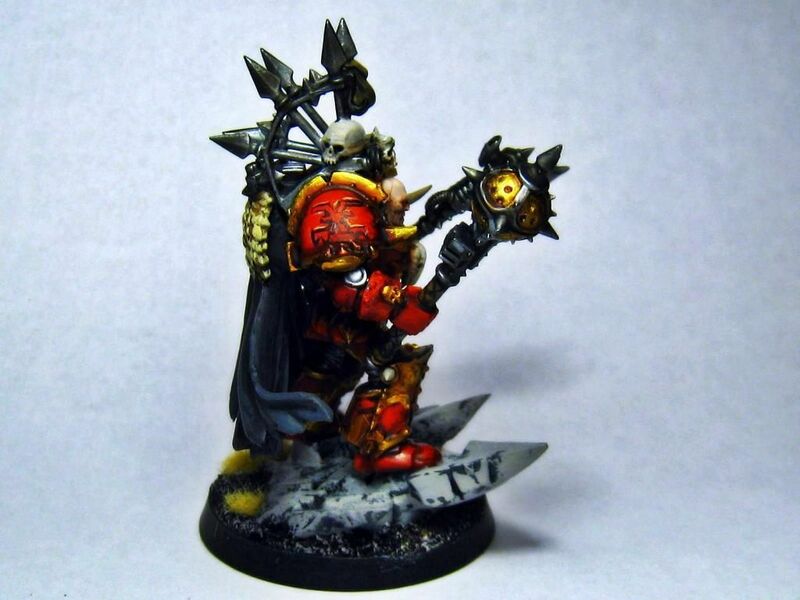 With that in mind, it was easy to figure out what this model should be-- a World Eater, a champion of Khorne. Who needs guns when you're a psychotic, lobotomized killing machine empowered by a dark daemon god of war? Kind of a fun diversion... I haven't painted one-off characters for a while, and those have always been my favorite things to work on.